Transcending reality is the new reality. The most comprehensive technology and production software for AR and VR is at NAB Show. As creators, developers, and marketers are working to incorporate the new reality into their stories and their content, the solutions and systems are on display here. Content creators are no longer bound to a linear canvas which is transcending the way we approach storytelling. No matter your industry, explore the ways to create, distribute, consume, monetize and industrialize the next-reality of content. As of today we feature 30 companies and their approach at the NAB2018 Show. This list is continously updated. 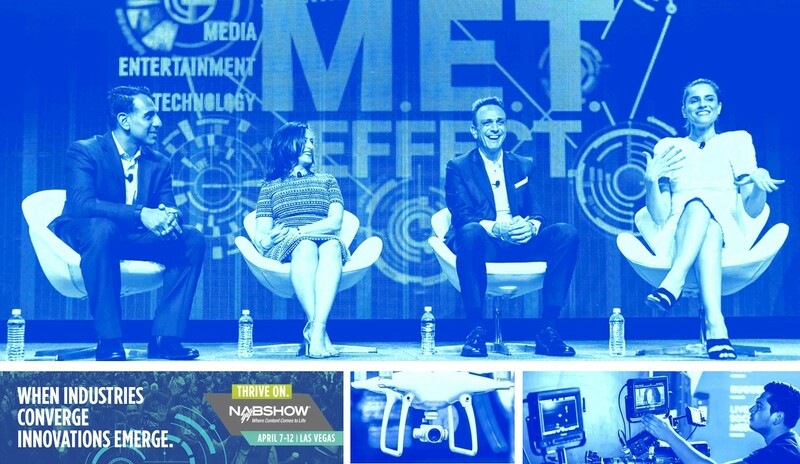 NAB2018 opens on 07April at the Las Vegas Convention Center. Game Creek Video serves the world’s largest television networks, production companies, and news organizations with state of the art mobile television production units. The Yogi Truck brings YES Network into the IP era. Yogi comprises two 53-ft. expando units: an A unit with a recommended work area of 64 x 24 ft. and a B unit with 72 x 19 ft. The two units will bring something new to Yankee Stadium as well: the ability for the YES Network and a visiting Fox regional network to work together, the YES Network calling the A unit home for its productions and the visiting network in the B unit. The A unit features a Grass Valley Kayenne K-Frame production switcher, a Calrec Apollo audio console, a Boland monitor wall, and Evertz multiviewers. There is also a video-shading area for four operators and support for up to 20 Sony HDC-4300 cameras operating in 4K mode. After the successful debut of OB2 and OB11 in 2017, delivering landmark 4K events such as the Isle of Wight festival – a European-first in entertainment broadcasting – and international test cricket for Sky, the refit project is now complete on OB4 and the trio is busy on the road providing HD and Ultra-HD production capabilities for contracted and ad-hoc assignments. OB4 was the third vehicle to undergo a complete technology refit and the unit went into action to deliver Sky’s 4K coverage of the PDC World Darts Championship over the 2017 Christmas period. The triple-expanding-side OB features 24 Sony 4K cameras, a 160-input Sony MVS-8000X mixer plus six EVS server positions. It is supported by Axon 4K signal processing and 3G glue with Axon’s 4K production tools providing up and down converters that fit in the same form factor as the 3GB/s modules. As well as installing a new fleet of 4K television cameras, screens and switchers, 22 FUJINON 4K HDR TV lenses were also installed, enabling productions to be shot in both 4K and HDR. Since opening in September, Strictly Come Dancing’s popular spin off show, It Takes Two, and star-studded chat show, The Jonathan Ross Show, were some of the first productions to record at BBC Studioworks’ Television Centre facility. Marc Horner, Marketing Manager for Fujinon TV Lenses at Fujifilm UK, adds “Fujinon UA box and ENG lenses are simply the best on the market in terms of resolution and HDR capability." The Riedel system is deployed across TVI studios dedicated to news, virtual production, and entertainment, and the three areas are linked by centrally and dynamically managed IFBs and mix-minuses with 2x39 simultaneous direct inputs from three different consoles (direct outs and mix minus) being used to create feeds. Working with this Artist setup, TVI staff in both audio and master control can take advantage of time-saving features including presets that recall snapshots of frequently used system configurations. Artist not only simplifies management of fiber lines between the studios but also serves as an audio router, equipped with convenient automation capabilities, for the 48 VoiP lines that facilitate guest commentary and live call-in contributors to TVI news programs. Addis Ababa City Government Mass Media Agency is known as ‘the voice of the city’, operating Addis Lisan magazine and the Metropolitan Journal alongside its TV station. Addis Ababa State TV is a 24/7 TV channel broadcasting a mixture of news, current affairs and entertainment programs over satellite and digital terrestrial broadcasts. To enhance its digital broadcast resources, Addis Ababa State TV appointed Onset Media Systems to design, build and commission a new digital workflow. Onset Media Systems specializes in the design and integration of bespoke systems to meet the needs of mission critical applications within its client operations. “Today, we reached the last milestone ahead of the 2018 FIFA World Cup. The events held across the 11 Host Cities and the video featuring FIFA Legends from all 32 qualified countries testify to the huge excitement felt by both the organisers and world football in general,” said Infantino. “In 100 days’ time, we will see the result of seven years of intense preparations by FIFA, the LOC, the Russian authorities and the Football Union of Russia. We have every reason to believe that this will be an outstanding tournament, with fans and teams sharing a warm, friendly and joyful atmosphere in Russia”. Proper communications during international sports events are of paramount importance to everyone involved. At the 2018 PyeongChang Olympics and Paralympics, it has fallen on the team at The P.A. People to ensure that the Clear-Com systems in use are keeping a large portion of key venue personnel in touch before, during, and after the events. The Clear-Com systems are used for the sports A/V presentation in the venues. Intercom together with timing and results information is linked back to the Olympic Broadcasting Services (OBS) and into the actual sport federation itself. Every system has three major components: the matrix, the partyline, and the FreeSpeak devices. LP Systems, Lawo’s partner in Poland for Audio Production, Radio and IP-based Audio/Video products, enjoyed a busy and successful year 2017 with Lawo IP equipment installed at various broadcasters and used as remote production gear at major international sports events in Poland. The World Games, held in Wroclaw, featured many sporting activities not covered by traditional Olympian events. The 2017 event saw 3,500 athletes from 112 countries competing, with 700 journalists from 50 countries in attendance to witness and report on the events. With a massive global audience spanning 131 countries, Polish company ATM System was responsible for providing broadcast resources at the IBC. “We had brand new 470W HMI lamps right next to the Spikies, and on a few occasions, I couldn't tell which lamp was which!” stated lighting and visuals designer Tom Sutherland talking about rapper Pitbull’s current “Time Of Our Lives” residency playing at the Axis Theatre, Planet Hollywood, Las Vegas. Tom has incorporated 110 Spikies into his rig … and the super-bright little luminaires from Robe are certainly holding their own in a substantial lighting rig of over 600 fixtures. Tom first started working with the popular artist, record producer and activist over the last year, and was asked to redesign his show by producer Macarena Moreno with whom he had previously worked on The Latin Grammys. The Claypaky Scenius Unico made its official debut in Argentina at the renowned Monsters of Rock (MOR) Argentina festival at Tecnópolis, Buenos Aires. The high-impact light show for the outdoor festival, part of the global Monsters of Rock movement, was designed by lighting designer Bryan Hartley and featured the Scenuis Unico as the show's high impact workhorse fixture. Headlining MOR Argentina was world-famous heavy metal band Megadeth who were joined by acts including Rata Blanca, Anthrax and others at the day-long festival. Held at Jawaharlal Nehru Stadium, Delhi on 27th-28th Jan and hosted by Event Capital & Talent Management, the second season of Bollywood Music Project (BMP) featured two stages, over 200 musicians and more than 50 artists performing for its high adrenaline audience. DiGiCo SD10 consoles, supplied by audio rental company Mega Sound, were at the very centre of the action. For two days, the city saw some of India’s biggest names head to BMP, including Farhan Akhtar, Papon, Vishal Bhardwaj, Euphoria, Nooran Sisters, Richa Sharma, Benny Dayal, Aditi Singh Sharma, Anusha Mani, Shilpa Rao, Shruti Pathak, Raftaar, Amitabh Bhattacharya, Kutle Khan, as well as other eclectic artists from the world of Bollywood music. “Augmented audio creates fantastically rich audio experiences, enhancing the sonic landscape with additional content for gaming, entertainment, productivity and beyond,” said Sofia Brazzola, Sennheiser, who manages the developers program. “The program is aimed at sound designers and game developers who are eager to create augmented audio apps and creatively explore audio interactivity.” Applications for the program will be accepted from March 9 to March 31, 2018. Developers interested in learning more and registering should visit www.sennheiser.com/ambeo-augmentedaudio, which is live since March 9. The AMBEO team will consider all applications and select a total of twenty participants to join the program. The top three applicants will also win an additional grant to support their app development cost. Launched with the claim “we’re gonna change the way you listen to music”, NRG Radio is changing the way its programming is delivered. Its three IP-based studios with visual integration – with equipment from German technical pioneer, Lawo – are capable of streaming live video from the studio to any Content Distribution Network (CDN), Social Media and other platforms. As the only broadcast system integrator in Africa to have implemented a similar system, Nairobi-based BYCE Broadcast was contracted to set up the entire to-air chain.